SOURCE: Nick Rains, courtesy of Tourism Australia, the tourism promotion authority of the government of Australia, used with permission. 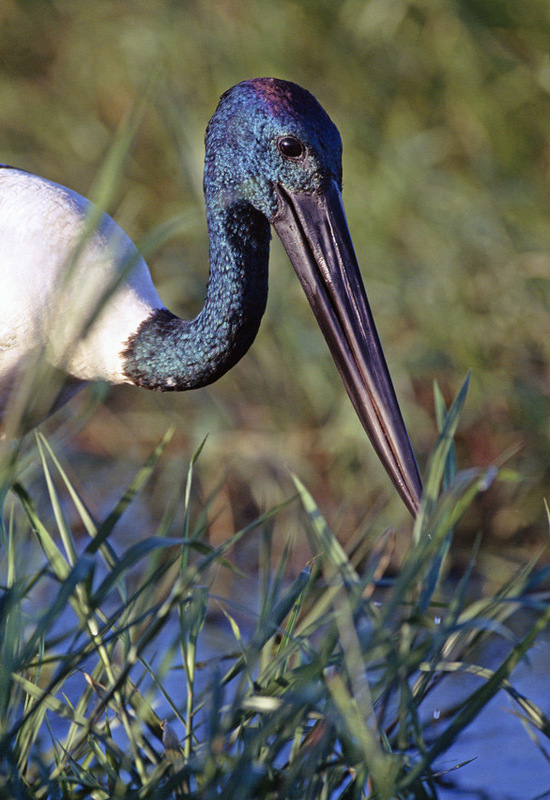 The name Jabiru , which usually refers to a large stork found in the Americas, has also been used for the Asian Black-necked Stork, commonly called "Jabiru" in Australia. The Black-necked Stork, i.e., Jabiru of Australia, is a large bird, 130-150 cm tall with a wingspan of 230 cm, weighing 4100 grams. Its plumage is quite spectacular, with jet black head, neck, wing bar and tail, while the rest of its plumage is white.